My time in Joplin has come to an end (June 5). After ten days, eight in the field, of volunteering my body is exhausted and it is time for me to move on. The heat and humidity (60%) down here have been quite oppressive; 94 F in the shade if you can find any. With the trees gone and the houses flattened shade is a commodity hard to come by. On Saturday I called it a day after working for four hours in the heat picking up debris. Debris = 2×4 beams, roofing materials, sheet rock – most of the time soaking wet (the day after the tornado Joplin was hit by a thunderstorm), fiberglass insulation (gets all over your skin and itches like hell), siding, building walls, basically anything you use in the construction of a house either in small pieces or big chunks or even whole walls, tree trunks and branches, personal belongings. All that gets separated into piles; tree stuff, home building materials and metal are the big ones. Trees/branches are supposed to get mulched, home building stuff ends up in the landfill or gets burnt and metal will be recycled. Any personal belongings we find are set aside for the homeowner to decide if (s)he wants to keep it or not. Unfortunately, we never knew if what we found actually belonged to the people who lived in that house or if it belonged to their neighbors near and far. 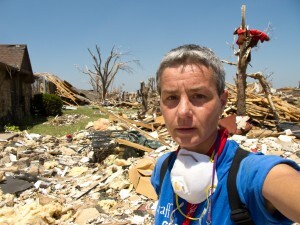 By the time I left Joplin garbage trucks started to remove some of the debris piles. I believe this will make a big difference and show that progress is being made. However, it will be awhile before the rebuilding can begin. Volunteers were taken by school bus to the various clean-up areas and over and over again I could hear the first time volunteers say: “this is not what you see on TV” and “this looks so much worse in person”. As I mentioned in my previous post, I stayed 20 + miles east of town in the countryside. A beautiful location, but the drive “home” was too much at the end of the day. Just by chance the lady at the University bookstore offered me to stay in their driveway five minutes away, lucky me. Mary Kathryn and Tom live right at the edge of the destruction. Fortunately, their house was not damaged and they only lost one tree. From their driveway you can see the start of the devastation across the street. 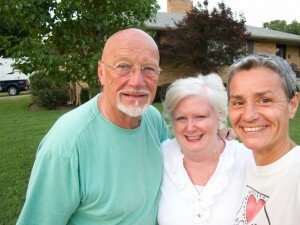 Thank you Mary Kathryn and Tom for letting me stay at your place and for having me “over” for dinner. I have worked with some great volunteers. I am always impressed when I hear from how far away they came or that they are sleeping in their cars in the university parking lot. One young kid lost his job in Wisconsin, took all his money to drive down here and is sleeping in a small tent on the university campus lawn. He got poison ivy all over his legs, stepped on a rusty nail and he still plans on staying here as long as it takes. That’s what I call dedication. The university didn’t object to the handful of tents on their lawn, but they didn’t spread the word about bathroom facilities. It took awhile to figure out where on campus the not so official showers and flush toilets were located. Even though I have a shower in my camper, I didn’t want to even drive a mile after a day out in the field without having showered beforehand. My skin was covered in grime; my arms itched from the fiberglass, never mind the overall sweatiness. On my second day I wore shorts, but quickly realized that jeans, even though much warmer, do a better job protecting my legs from the itching fiberglass. One of the days I didn’t work in the field, I helped out at a donation warehouse. People had dropped off loads of clothing, food and toiletries. All that needed to be sorted and organized. Did you know there is organic herbed chicken with pasta BABY food in a jar? Why?? Anyway, Joplin residents who had been displaced would come to these warehouse locations and pick-up what they needed for the moment. It is hard to comprehend to have to start at zero. Even harder to comprehend is how some people take advantage of these bleak situations. We had to cross-out the barcodes on all new items we received because word had gotten out that some people were re-selling these items. Hopefully these were only isolated instances. I spent the last day of my volunteering duties doing some data entry. After spending days in the heat moving and lifting heavy stuff I figured I’ll give my body a break and sit in front of a computer in an air-conditioned room instead. All those hours the volunteers put in need to be logged. 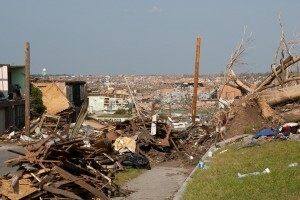 The tornado destroyed about 30% of Joplin; however, you can drive around town and never know what happened. People in the unaffected areas, even if they are only a block away from destroyed homes, go on with life as usual. It was odd to see people mowing their laws and trimming the edges. I had planned on visiting Joplin long before this disaster happened and so I decided to play tourist for an afternoon after work. I drove to the old / historic downtown. 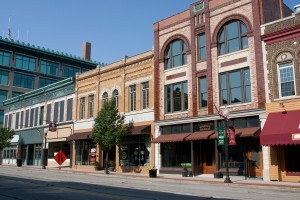 Joplin used to be a zinc mining town in the early 1900s and many of the old merchant buildings along Main Street are still standing. 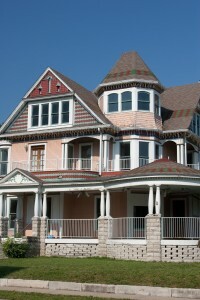 A little to the west of Main Street is a residential area with several very nice Victorian homes. None of this was touched by the tornado. The number of volunteers that sign up and go out into the field under AmeriCorps’ organization has dwindled. On Sunday only a couple of hundred went out into the field for debris removal versus thousands last weekend. Let’s hope that people will continue to come out as long as they are needed.